An illustration of forward thinking transit oriented infrastructure development now being completed at the still unfinished University of Washington light link station, scheduled for completion in 2016. 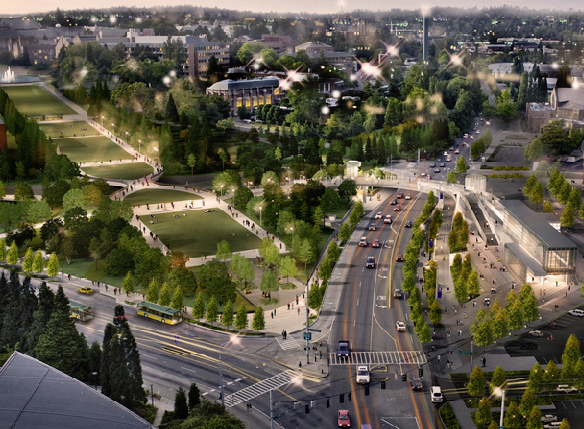 In 2014, the Friends of Mt Baker Town Center reached out to the University of Washington Department of Civil & Environmental Engineering with a proposal. We asked if the University might be interested in studying the complex infrastructure problem at the heart of the nascent Mt. Baker Town Center. 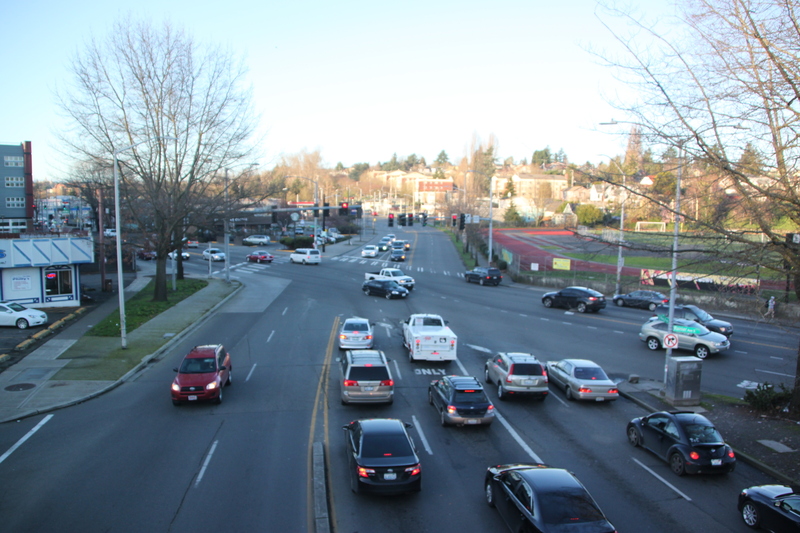 Specifically, could the UW focus its energy and creativity on the task of creating a vibrant pedestrian and transit oriented development at a location where 12 lanes of Rainier Avenue South and Martin Luther King Jr. Way collide? And as an added bonus, could they restore the original Olmsted Parkway connection between Cheasty Boulevard and Mt. Baker Boulevard, and link the Town Center to the adjacent neighborhoods of Beacon Hill and Mt Baker? We were delighted when Professors Ed McCormack and Stephen Muench accepted our proposal, and selected the problem for the UW’s Senior Engineering Capstone project. In March, the Senior students heard presentations from Friends of Mt. Baker Town Center, Friends of Seattle Olmsted Parks, and Seattle Department of Transportation. They also heard an overview on the Department of Ecology’s Brownsfield Development Program, from two Ecology representatives who met earlier in the day with Friends of Mt Baker Town Center and the Department of Parks to discuss Rainier Valley contamination issues. Since those initial presentations, the UW seniors performed a site visit, and split into teams. They are now busy working on a professional analysis and proposal for solutions. The various senior teams will present their proposals in a professional format this June, as the culmination of their Capstone program. This intersection lies in the center of a so-called “Town Center”, which is designed to serve a growing population of residents with pedestrian and business friendly development up to 125′ high. The walk zone around this station area already includes the Mt. Baker Lofts, which was built and occupied by families and artists looking forward to the promise of a safe and livable environment. We appreciate the support of the University, SDOT, and the many other agencies and nonprofits who are now beginning to focus their energy on how to realize the potential and promise of a Town Center that can serve its current and future residents and businesses, and move the region’s development plans forward in a positive and equitable manner. Interesting discussion about this is on private NextDoor network. You’ll get a lot of important input from listening to the people who actually live here — but may not be free to get to meetings or participate in a more substantial way. Often these big projects hear a lot from the corporate stakeholders (think the viaduct) but the day-to-day users have less of a voice. Thanks for engaging the locals!